On most mornings you will probably spot Polly down at her local cafe having a coffee or maybe stickering away with her kids. Polly is currently on maternity leave from her job as a physiotherapist at St Vincent’s Hospital, Sydney, Australia. She had her second child 6 months ago and was diagnosed with gestational diabetes mellitus (GDM) early on in her first pregnancy and needed insulin from week 8. GDRecipes: What does a day in your life currently feel and look like? Polly: At the moment, I crave sleep! I am usually up before 6am and already drinking a coffee at Bar Coluzzi (with Nina and Archer in tow). I am constantly cooking meals for someone, doing drawings/stickers/stamps/telling or reading stories. We try to go out for adventures most days, to museums, the zoo, the city, trains, buses, the monorail (a recent favourite), the library or the park. GDRecipes: How did you feel when you were diagnosed with GDM in your first pregnancy? Polly: It wasn’t altogether a surprise. I had had a glucose tolerance test (GTT) 18 months before because of our family history and found out then that I had Impaired Glucose Tolerance. Still, it was a bit of a downer, as I was put on insulin from about week 8. GDRecipes: So what is your family history with diabetes? Polly: My mum is one of 4 and she was diagnosed with diabetes mellitus (DM) 8 years ago. I have 2 brothers, and before my younger brother was born, my mum lost a baby who was born at 34 weeks. On his birth, it was queried whether she had had undiagnosed gestational diabetes (GDM). Of mum’s siblings, her 2 sisters both had GDM, and one of their children was born with tetralogy of fallot (a congenital heart defect) possibly linked to undiagnosed GDM. That aunt was on insulin for her second pregnancy. My mum’s brother has DM. My younger brother was recently diagnosed with DM. My cousin who was born with the tetralogy of fallot had a glucose tolerance test last year, and has impaired glucose tolerance. Another cousin has 2 young children, and she had GDM and was on insulin for both her pregnancies. Also, my maternal grandfather and great-aunt both had/have DM. GDRecipes: What were some of the things that helped you manage your GDM at the time? Polly: My dad is a general practitioner (GP) and former obstetrician, and it was he who referred me for a GTT basically right after I told him I was pregnant. With his knowledge of our family history he was right on to the GDM and helped me so much. It was wonderful to be able to just call my dad at any time if I had any pregnancy or diabetic questions which came up. He was and is an immense support. I also had a very good obstetrician who referred me to a lovely endocrinologist. She had me email her weekly with my blood sugar levels (BSL) and helped me adjust my insulin, which helped with my understanding of how the whole disease worked. Also, I was referred to a Diabetes Education Centre where I saw a dietitian and a diabetes educator, who were both really helpful and I saw a lot of them for the first few months. At work, my close colleagues were amazingly supportive. They kept lollies in drawers, and kept a close eye on me having witnessed a few of my hypos early on. GDRecipes: What practitioners did you see through your first pregnancy and can you tell us about the different information or support you received through each of them? Polly: I emailed my endocrinologist weekly with my BSLs and any questions. She was always very prompt with answers. Also, I saw her in person maybe 4-5 times during the pregnancy. The dietitian at the Diabetes Education Centre was fantastic, and always coming up with ideas for me for meal planning and snacks. We went to America for 4 weeks holiday when I was 4-5 months pregnant and she was great in helping me with travel related questions, providing me with extra insulin cooler bags, advice for the plane and how to adjust my insulin while changing time zones. I saw her probably 7-8 times all up, and she too was always only an email away. She recommended a book called ‘The Traffic Light Guide to Food’, which was written by the Diabetes Education Centre at Royal North Shore Hospital, Sydney, Australia, and it is a great resource, giving the carb value of so many commercial foods, and just pointing you in the right direction nutritionally. GDRecipes: How did having GDM change your way of thinking or your attitude towards nutrition? Polly: I was suddenly aware of the amount of carbohydrate present in everything I consumed. In America, there are several photos of me that my husband took, in a store comparing food labels! I had always had a pretty good diet anyway, and don’t have a sweet tooth fortunately, but I did find it so frustrating the way having GDM meant I couldn’t just eat an apple, for example, if I just felt like it. (Well, I could, but I’d give myself an extra jab of insulin in order to do it.) I was very disciplined while I was pregnant, and always made sure I had things I could eat or snack on around, like nuts or raw veggies. The dietitian was good also in making sure I was getting enough carbohydrate, as especially in the second pregnancy, I was really lacking energy, probably partly due to my decreased carb load. So, we factored in some extra insulin, so I could have a bit more energy food. GDRecipes: You were subsequently diagnosed with type 2 diabetes in your second pregnancy. Was there ever any indication that this was coming? Polly: Absolutely. After my first pregnancy, I returned to my impaired glucose tolerant self and felt 99.9% sure I would be on insulin again for any subsequent pregnancies. GDRecipes: You said your pregnancy with your first child went really well and post-labour your placenta was biopsied and showed no signs of GDM. At that point did you feel like diabetes was over and done with? How did you handle this second diagnosis? Polly: I knew it wasn’t over, but I definitely let myself enjoy the pistachio gelato I’d been missing! I followed a reasonable diet but was nowhere near as strict with myself as I had been when I was pregnant. I saw my endocrinologist after my first child’s birth, and I was on no medication until I finished breastfeeding – which I did for almost a year. After that stopped, she had me go onto Metformin, and then added Diamicron as well. I was on those for 3 months, and my HbA1c did not change in that time. So, when I found out I was pregnant the second time, which was after I’d been on the medications for about 4 months, I stopped taking the medication, saw an endocrinologist the next day, and was on insulin that afternoon! It did put a dampener on the exciting news to say the least. GDRecipes: How has your family (partner and relatives) been with your diabetes throughout both your pregnancies? Is it something they understand and you can easily talk about? Polly: My husband has been really supportive. He pretty much ate what I ate at home, which was good, as I didn’t feel like I was really missing out on something more appetising. He has a very good understanding of diabetes, and my dad talked to him at length about how to look out for hypos when I might be in denial that I was having one. Also, he gave Matt a vial of Glucagon (which he’d need to inject me with) to have in case of absolute emergency. Dad said if we had it we’d never need it (which we didn’t thank God). All my family have been excellent, especially Dad and Mum, and Mum always made sure she had plenty of berries and nuts and cheese whenever I was around. We had a few short holidays with my older (non diabetic) brother and his wife, and they always went out of their way to accommodate my dietary needs. Also, my cousin was pregnant both times at the same time as me, and she too was on insulin. We had the same obstetrician and endocrinologist as well, so we had heaps to chat about and compare! GDRecipes: In what way was your second pregnancy more or less psychologically and emotionally challenging than the first? Polly: I think I found the whole managing diabetes easier the second time around. I guess because I’d done it before it wasn’t that scary, and also, I knew that my first baby had not been adversely affected at all by it – so that gave me confidence in my management. Also, having a toddler to take care of meant that I had little time to really think about it that much anyway. I definitely found the first pregnancy experience a lot more emotionally challenging. The second one flew by in no time at all and suddenly I had another baby! GDRecipes: Is it getting any easier to manage your diabetes? Where are things at now? 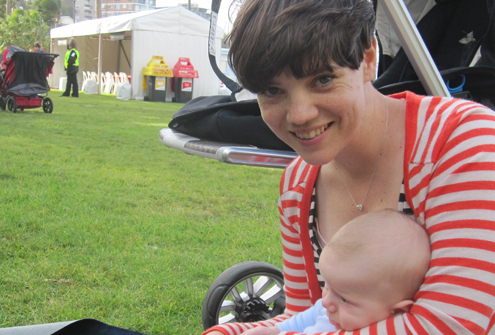 Polly: I had an HbA1c in February this year – 5 months postpartum, which indicated I was now a type 2 diabetic. I felt pretty down about that, but at the same time, was not exactly following a diabetic diet in the 5 months since Archer was born. So, now I am on a long acting insulin which I take before going to bed each night. I’ve had to increase the dose quite substantially from where I started in order to get my fasting levels in an acceptable range, but now do actually feel somewhat in control. My endocrinologist has me on the insulin now as I am breastfeeding, although she says when I stop she will most likely put me back on tablets. To be honest, if the insulin works at keeping my HbA1c down, I think I’d rather continue to do that. The tablets gave me tummy upsets, and I really didn’t like taking them. We’ll see. GDRecipes: How do you feel in general? Polly: I feel really healthy. I have gotten back in to running a couple of times a week and apart from the lack of sleep that goes with having a 6 month old and a 2 1/2 year old I feel great. I do wish I had more time though for exercise and for sleep and just for me! GDRecipes: How does diabetes impact your everyday? Polly: Basically, I should be taking a fasting BSL and another 2 hours after a meal each day. I seem to always do the fasting one but often forget about the post-meal one. And sometimes I am lying in bed at night, and will suddenly remember I haven’t had my insulin, but I’ve never actually forgotten to take it. I eat sensibly and will have the odd treat. I am not overly worked up about it. I look at my mum and the rest of my family with the ‘bad gene’, and none of us fits the typical DM mould. We all lead healthy, active lifestyles. No-one is overweight and there is no family history of cardiovascular disease which is a positive. I figure all I can do is try to live a healthy life. GDRecipes: What advice would you give a woman recently diagnosed with GDM? Polly: I would advise them to take the diagnosis seriously, as it can definitely have adverse effects for the unborn baby. I found focussing my thoughts about GDM on the baby was really motivating and gave me the willpower to make sure I kept it under control. A good endocrinologist who will support you and refer you to a team of other supportive professionals (dietitian, educator) makes it so much more manageable, and for me, that meant I always felt there was someone to turn to if I was struggling, or just needed someone else to talk to. You can view GDM as an enforcement to eat a better, healthier diet, and motivate you to keep exercising.